" I feel the world around me with all my senses. I absorb the essence and create harmony in colour and shapes, I am a lover of life and a painter of the senses." Born in 1933 at Chamra, Dist. Kheda (Gujarat). 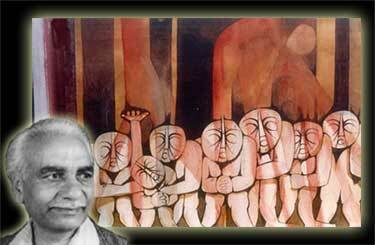 Graduated 1958 from world famous institute for arts - Faculty of Fine Arts, M. S. University of Vadodara. Fellowship for a year's higher studies in Mural Paintings at the same University. Cultural Scholar 1959-61 under Prof. N. S. Bendre, sponsored by the Ministry of Cultural Affairs, Government of India. click to continue . . . .